"Should politicians be tried for the crisis?" There’s nothing quite like a kangaroo court, or a expression of impotent rage, or (secretely) a public hanging to get Europeans excited. And I think that, even more than bankers and businessmen, the politicians are ultimately accountable for their lack of vigilance – or even worse, at times, for political complicity with the former. Those who hold great responsibility and are paid in one form or another for such responsibility also have a duty to respond to failures of management. That a crisis like the one we are living through should have no guilty parties is the biggest slap in the face to its victims. Will no one stand up and answer for it? I’m still trying to figure out if this is any different from the Chinese executing the minster in charge of food safety a few years back. Iceland’s former Prime Minister, Geir H. Haarde, has appeared before a special court accused of “gross negligence” in the country's financial disaster of 2008. The crisis caused three banks to collapse, payments of its foreign debt to be suspended, the currency to fall and unemployment to hit ten percent. Did European governments know what was coming before the crisis hit them? How much responsibility did the banks have? Do we need more robust judicial action against politicians and bankers? An answer worth actually waiting for, but no, I doubt that anyone could have projected the precise value of their worthless debt built up by their welfare-addicted countrymen in the marketplace in 2009.
writes Judy Dempsey, speaking a bout those same pace-loving Europeans who — yes — were opposed to Bush's war and were giving lessons in talks and negotiations to those warmongering Yanks along with lectures in not supporting dictators like Saddam Hussein, autocrats who were invariably "created" by Uncle Sam in the first place. Many E.U. countries had been exporting weapons to dictatorships and authoritarian regimes, often with scant regard to whether the arms were used for quashing dissent and propping up the status quo. Shamed by their support for these regimes, the Arab Spring has given Europe a chance to start fresh — not only with that region but also with how it does business with dictatorships in Central Asia. But two new reports, one by the European Union and the other by Sipri, the Stockholm International Peace Research Institute, show that European companies and governments are seeking markets for their weapons outside Europe more eagerly than ever. Not all these markets are in stable, conflict-free, democratic countries. This raises the question of how Europe can square its commitment to defending human rights with selling weapons to such countries. The answer is, Europe can't square doing so. Or haven't you understood yet that it's all talk and self-serving auto-congratulation? … probably the most interesting implication of the report is that Europe’s arms trade to many countries is at odds with the Union’s commitment to human rights. Member states continue to sell large quantities of weapons to dictatorships and authoritarian regimes, according to new statistics published by the Union. I Swear, They’re All Out to Get Me! Europe's main conservative leaders deny any plot to snub French Socialist presidential hopeful Francois Hollande, but experts say they are nevertheless nervous about the untested candidate's plans. "Informed sources in Britain, even in the (opposition) Labour Party, are afraid of possible financial instability following a Francois Hollande victory, and many in the (German opposition) SPD are even more sceptical," said John Gaffney, a French politics specialist at Aston University in Britain. Germany's Der Spiegel magazine caused a stir last weekend by reporting that right-wing European leaders were "scandalised" by the Socialist's declared intent to renegotiate the budgetary discipline pact signed on Friday. They consider the pact key to rescuing the debt-stricken eurozone. Hollande, who opinion polls consistently say will easily beat President Nicolas Sarkozy in the two-round vote in April and May, has also raised eyebrows by declaring that the "world of finance" is the "enemy". Actually, it more of a case of paranoid self-flattery, as if the world had to somehow stop this great mind. Here’s a towel for when you’re done beating your meat, Gaucho. Hey, lady! Get a shave already! Despite doing virtually nothing about their own debt problems for years, and being the Eurozone being richest entity on earth, they do little more that fish for pity and aid from afar. Only on very rare occasions to do we hear anything positive about Europe, and with this in mind we should welcome the remarks made by 62-year-old Republican and former White House advisor to Bush Senior, Richard Breeden, at the the party to celebrate Romney’s victory in New Hampshire, who insisted that the bid to “stabilize” Europe is “vitally important” for the US – words that are particularly resonant words when you consider the past of the continent. Europe is where they do away with the infirm elderly, and where cruise line captains are the first to jump ship in the event of an accident. It is the place where the ailing euro continues to be a source of contagion for the rest of the world and where the economy is strangled by cumbersome and prohibitively expensive welfare states. Worse of all, it is a place where the future of the young generation is sacrificed. If it wasn’t, Europeans wouldn’t be trying so hard to unwind the state of “state managed personhood” to begin with. The Eurozone spends more on welfare than the entire rest-of-the-world combined, and they know it. But if someone form a part of the rest-of-the-world called the United States mentions it, all bets are off. It’s a level of emotional manipulation that they reserve for the US, and should try that with the CHINESE PUBLIC OFFICIALS who have openly criticized the horrible effect that the European attitude of welfare is having on the rest of the world’s economy. 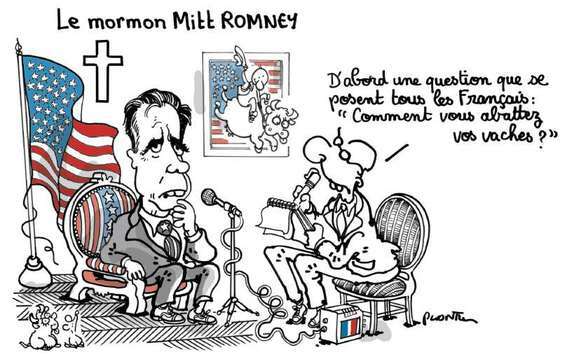 While The Plantu offers a cartoon that seems hardly comprehensible (see bottom of post), Philippe Bernard has a story in Le Monde concerning Mitt Romney's stay in France in the 1960s when he was a young Mormon and when he was taught lessons in "modesty" from Frenchmen slamming their doors in his face telling him that America should scram from Vietnam. It starts out with a car accident in 1968 that almost killed Mitt, 21, who was at the wheel — caused by the other driver, who happened to be a Catholic priest — and that did kill one of his passengers. Une route nationale qui serpente dans la campagne bordelaise, un virage serré à l'entrée du village de Bernos-Beaulac devant un bureau de poste rural. C'est dans ce paysage banalement français que, le 16 juin 1968, a failli s'arrêter net la carrière de Mitt Romney, probable adversaire de Barack Obama et potentiel futur président des Etats-Unis. Une Mercedes a déboulé en sens inverse et a manqué le tournant. Elle a heurté "de plein fouet" la DS 21 conduite par le jeune missionnaire mormon Romney, alors âgé de 21 ans, "fils du gouverneur du Michigan aux Etats-Unis", précise à l'époque le quotidien Sud Ouest. Sur le coup, un gendarme écrira : "Il est mort" sur le passeport du jeune prosélyte américain. En réalité, Mitt Romney s'en tirera avec un bras cassé. But another event was also instrumental in the young Mormon's development, says Philippe Bernard. There were also the student revolts of May 1968, which he assimilated to anarchy, along with the general distaste against the Vietnam war. …le drame routier de Bernos-Beaulac ne fut pas, de loin, le seul événement marquant de son séjour, au Havre, à Bordeaux, puis à Paris, entre juillet 1966 et décembre 1968. Le futur candidat à la Maison Blanche, qui, en costume cravate, passait jusqu'à dix heures par jour à faire du porte-à-porte pour diffuser "la parole de Jésus", vécut la secousse de mai-juin 1968 dans une totale stupéfaction. "Nous n'en croyions pas nos yeux. On se disait : "Mon Dieu, les gens sont devenus fous." Le développement d'une situation d'anarchie nous perturbait. Nous ne regardions pas avec sympathie cette explosion de la société, témoigne Dane McBride, un médecin américain de 65 ans qui fit équipe avec Mitt Romney. C'était à l'opposé des valeurs d'ordre et de civilité que nous voulions propager." 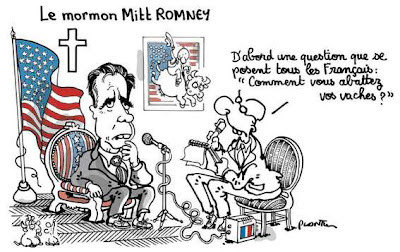 Cet effroi rétrospectif, Mitt Romney l'a exprimé à sa manière en 2007 : "Mon expérience en France, a-t-il dit, m'a permis d'apprécier hautement (...) la valeur d'un système fondé sur la libre entreprise. Je suis rentré aux Etats-Unis avec la conviction que ces choses ne sont pas universelles, que ce dont nous jouissons ici est tout à fait unique et donc fragile." Lui qui réprouvait la violence sociale apprit en France les émeutes de Detroit de juillet 1967 (réprimées à la demande de son père) et l'assassinat de Robert Kennedy en juin 1968. Lui qui prêchait pour une Eglise refusant à l'époque d'ordonner des Noirs reçut en France la nouvelle de l'assassinat de Martin Luther King en avril. "Nous souhaitions que notre Eglise évolue. Mais, quand les Français refusaient d'ouvrir leur porte en nous reprochant le racisme des Américains, nous répondions : "Et vous, que faites-vous des Arabes ? "", raconte encore Dane McBride. • First a question that all Frenchmen have been asking: "How do you put down cows?" France’s prime minister has urged Muslims and Jews to consider scrapping their halal and kosher slaughter laws as president Nicolas Sarkozy and his allies stepped up their efforts to woo far-right voters. Prime minister François Fillon made the suggestion after Mr Sarkozy called at the weekend for butchers to clearly label meat slaughtered according to religious laws and his allies warned immigrants might impose halal meat on French schoolchildren. François Fillon has raised a nutty, nutty point that helps to point out that France’s collective notion of laïcité has absolutely nothing to do with anything it takes up in a discussion of laïcité. "There is something unpleasant, humiliating, and contrary to our republican tradition", said the community leader about the return of Francois Fillon. On the proposal of Nicolas Sarkozy to label meat "according to the method of slaughter", the head of CRIF said: "It seems that the candidate Sarkozy has not quite the same positions as President Sarkozy. I see. " Of course the terminally infantile press corps has framed the whole thing to be (unsurprisingly) the story of them uppity Jews asking for something again, but a zoo visitor can easily identify something different: strange factional politics, a tribal world view, and a picky, nutty, government rulemaking that even the center-right struggles with. Otherwise those who can’t avert their eyes from French public polity can always have the ritual slaughter of decency to look forward to. Robert B Sherman, who penned songs for Disney classics including Mary Poppins and The Jungle Book with his brother Richard M, has died in London aged 86. … Mary Poppins … featured some of their most enduring compositions, among them A Spoonful of Sugar and the Oscar-winning Chim Chim Cher-ee. … For 1967 favourite The Jungle Book, Robert and Richard wrote Trust in Me, Colonel Hathi's March and I Wan'na Be Like You. The Aristocats, Bedknobs and Broomsticks and the Winnie the Pooh shorts were among other Disney productions to feature their words and music. Their fight with President Obama over contraceptive coverage is becoming a losing battle for Republicans, a significant chunk of whom reject GOP leaders’ stance that it’s a fight about religious liberty, according to the latest Washington Times/JZ Analytics poll. Progressive Dream of Nightmare ? Get a load of these jokers: erstwhile East Germans protesting the reduction of subsidies to the solar industry – which only serves to raise those protesters’ electric bills too. When it comes to solar subsidies, Christine Lieberknecht is willing to protest. The Minister President of Thuringia (CDU) wants to take on any argument against any quick or dramatic drop in subsidies for solar panels. "This will definitely be stopped," she told Deutschlanfunk radio. The State's leader threatens the federal government even with a veto in the Bundesrat - should there be any changes to the proposed law. With this hard-line stance, Lieberknecht represents a frontal assault on her own party - and is more in line with Green Party leader Juergen Trittin. Nevertheless, she is not alone. Also Reiner Haseloff, Minister President of Saxony-Anhalt requested changes. And can the coalition partners in their own country's government set Lieberknecht anyway: Thuringia economy minister Matthias Machnig (SPD), the reduction in feed-called "industrial policy madness." In his State to the SPD and CDU were "completely agree that we can not accept the cuts." It should be noted that the industry only exists, and is only in the eastern Länder because of federal subsidies, and only because they still think that industry there needs some sort of hair of the dog to cure what they think is left of the bad hangover from failed Eat German industries. Interestingly enough, while the labor agitation part is all Marxist-Leninist in sprit, protesting against “the man” (which was the state,) was never really permitted, and when it did happen, was suppressed with life fire. In fact that workers’ paradise where the working man was supposed to be so well empowered dessicated labor unions of their power, and made them into a impotent smokescreen and a distraction. They were unaware that by this action they were giving the signal for a workers insurrection which would spread like a brushfire over all of E. Germany. On trio 16th and 17th of June, 1953, the Bolshevik regime of the G.D.R. was made to tremble. The wage slaves of state capitalism went into action even in the remotest Corners of the land. I wonder if anyone has mentioned this to American “radical adgitator” Katrina vanden Heuvel, the editor of the Protazoically retrograde “Nation” magazine, and a woman who spends a large amount of her time hoping for a race war in the United States for the sole reason that she thinks that only whites are conservatives, and therefore the fanning the flames of one is good progressive “progress”. After all, she’s white, and in a very rare move for someone of Flemish origin, even for a monarchist aristocrat, has retained the monarchical aristocratic form of her family name which is a cheerleading tag-line for inherited power and oppression of the worker. Then again, she’s a “progressive”. They don’t get the real meaning of the emotional, personally slanderous hatred they toss around, much as the East German regime that had as a platform of their establishment the freedom of labor unions, and then shot at them when they demanded their rights, but always seem to find it politically useful for themselves and their own power. Dreams That Money Can Buy, 1947: Collaborators included Max Ernst, Marcel Duchamp, Man Ray, Alexander Calder, Darius Milhaud and Fernand Léger. What does France need more at this moment: a man who says “I will save you,” or one who says, more modestly, “I will help you save yourselves”? Is it possible for Nicolas Sarkozy to remake himself in the eyes of the French and defeat his opponents in the final sprint of the presidential race? … the answer is far from clear, even if public opinion polls indicate a narrowing of the gap. … It is also a competition between two different individuals and two different styles. Sarkozy — “The Artist” of French politics in his very vocal way — is perceived by many as “too much” after five years of rule, while there are doubts whether Hollande is “enough.” The former is a natural leader, instinctively divisive in his approach; the latter has a more consensual nature and thinks of himself as a mediator. What does France need more at this moment: a man who says “I will save you,” or one who says, more modestly, “I will help you save yourselves”? Might the figure of the “populist savior” be anachronistic? The election results hang on the answer to this question. … A great part of the opposition to Sarkozy is fundamentally unfair. To many French voters, he is unpresidential: He is not the product of the right schools, his pursuit of bling-bling is perceived as vulgar. He is also seen as unpredictable, changing positions for reasons of political expediency. François Hollande, with a double-digit lead over President Nicolas Sarkozy in polling for the May 6 vote, has taken the issue of where’s-the-growth and run with it. … Europe’s dreadful economic projections for the year are real to French voters, and the Socialists portray the situation as one pitting the advocates of blossom and bloom against the forces of stagnation and futility. Pierre Moscovici, Hollande’s campaign manager, has said the chancellor used Sarkozy, an eager servant, in creating a pact accepted by “many European countries under constraint and through force.” Martine Aubry, the Socialist Party chairwoman, insists that support in the European Union for a French-led rewrite of the treaty will be substantial. Could they all buy into a new French Socialist president’s leadership and economic credibility? With difficulty, considering Hollande’s refusal to junk his country’s growth-killing 35-hour workweek, and the vagueness of his stimulus plans to jog the E.U. economy. … The likely French election results point mostly in the direction of the chain of creaky compromises and nondefinitive Big Decisions that characterize the Union’s history of shining possibilities and smudged reality.